Tangled and True: maternity photos. Maternity photos. What do you think of them? Are they an absolute for you? Or do you shy away from the camera especially when pregnant? I have never done maternity photos, I haven't ever wanted them, but when I saw the picture above I loved it. I want a picture like that. And so I feel torn, with no real pictures of the other pregnancies, should I be taking pictures of this one? I think I love this one because it wouldn't show my bare belly that is not so attractive or my swollen nose, and yet I am still debating. I took some with my pregnancy in '06. Lingerie maternity photos. It was fun. There were also some of me in a white dress climbing a tree... I think it would be okay for you to get some done. I know there are going to be plenty of things I'm going to do with later children that I never thought of with Russ. It'll be fine. Especially if you include the other children in the photos with your belly. I don't dig maternity photos personally. (although I have to say that I get at least 4-5 maternity session request a month so a lot of people do). I'm all about taking a picture of when I was pregnant so I can look back and see, but not a full session...nope.not.me. I'm self conscious about being pregnant, so I only have a few snapshots (maybe 3) of my first pregnancy. None at all of this one--my hubby never ever thinks to pick up the camera. Never. I feel strange asking. Only 7 more weeks. Too late now for pictures. Not a fan of the bare belly shots. I had them taken when I was pregnant with my son and am so very glad I did. They're hung on the wall along with all of our other family photos. Such a beautiful and special time. The right photographer makes all the difference. 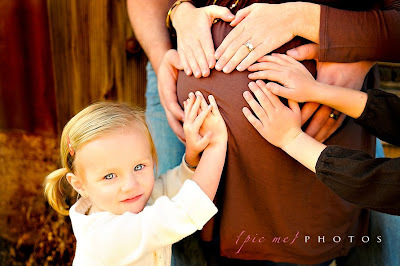 That is my belly in the shot and my families hands placed on it! I debated the idea because I didn't do it with my others. I couldn't be happier with the shots. This is my last pregnancy and we got twins!!! There was no way I could pass up the chance. About not doing it with the other pregnancy. I was able to include my children in this shoot. These pics will be cherished by my whole fam FOREVER!!! You won't regret it, I have some awesome shots with my husband as well. I say, why not celebrate the miracle? I really do love maternity photos. I wish I had taken more or had some professionally done when I was pregnant. I say that now that I'm not pregnant. Had you asked me while I was pregnant I would have protested heavily if anyone came close to me with a camera. I think they're a must. I've only had one baby but I absolutely LOVE my pregnant pics. It was such a special time and I LOVE having great photos to capture it. I promise you will be happy you did it!!! Hate them. Maybe if people would take them and keep them in their private bedrooms or something they'd be okay, but folks want to share them and show them. I usually hate them, but I kind of like the above. It's not a creepy here is my bare belly out there and the lace curtains blowing in the wind. haha I think this one was a cute way to do it. I kind of wish I had taken a few more (I have 1) pics of my tummy. Vanessa at photosbypicme, are always so beautiful and professional. I recommend her for any occasion, not just maternity. I love to see moms of any age and size showing off the miracle growing in them. I hardly took any photos of my first pregnancy (just one quick "photo shoot" in the backyard a week prior to my due date). I'm taking more photos with this pregnancy, but not professional ones and not hundreds of them. I'm really glad you posted this photo though because I like how the focus is on the older sister...and the family...and not just on the belly (I, too, am not a huge fan of the "bare belly" shots).